This weekend, I went away for three nights. Today I’m at home for a few hours, then I’ll jump on a plane and head out for a week of vacation. In a way, it’s nice – as anyone with diabetes will tell you, success is all about planning – if you can plan for it, you can survive it. So the weekend mini-trip felt like practice for the week-long regular trip that’s coming. Anything I forgot to pack I could make sure I corrected for today. Not that it seemed possible I’d forgotten anything. Above, supplies for a three-day vacation away: infusion sets and back up infusion sets, test strips and back up test strips, alcohol swabs and back up alcohol swabs, IV prep and back up IV prep, medical tape, insulin, back up Dexcom sensor, cartridges and back up cartridges, back up insulin in the form of Lantus (one-a-day injection) and Apidra (rapid acting injection), pen needle toppers and back up pen needle toppers, glucose tabs and back up rapid acting glucose in the form of smarties and pixie stix. Not pictured: Fiber 1 Bars (I find they’re good medium-acting carbs if my blood sugar is dropping, but not so so rapidly), Think Thin bars (back up for meals if there’s nothing better). I figured I was prepared for every eventuality. I wasn’t. I forgot – (you MORON, how could you forget this?!) – juice boxes. The ultimate fast-acting carbs for those super nasty lows (I had 3 in the space of about 20 hours, hooray for changing up the routine!) when your mouth isn’t quite working well enough to chew glucose tabs and you frankly need something a little bit faster. How could I forget JUICE BOXES? I’m getting on a plane in a few hours, and I have replenished my stock to include all of the above, plus more back up infusion sets, test strips, Dexcom sensors, cartridges, a full 8-pack of juice boxes (which added some heft to my suitcase), two more boxes of Fiber 1 bars (I went though almost 5 bars in 3 days. Yikes), and I’m about to head to the store to pick up more meal-replacement bars. Meanwhile, while I was typing this, I just remembered I’d better bring the charger for my Dexcom sensor and a back up Lithium battery (regular old double A just doesn’t cut it) for my pump. Some of these things, obviously, I could buy when I get there. Juice boxes tend to be sold most anywhere. I’m told you guys have those on the west coast, too. In a pinch, I could call my doctor’s office and get a new prescription for insulin called in to a local pharmacy (been there. done that), too. But my infusion sets and cartridges are literally special ordered. If I run out of those, there’s no Back Up Pharmacy that’s going to stock them. The pressure feels high. 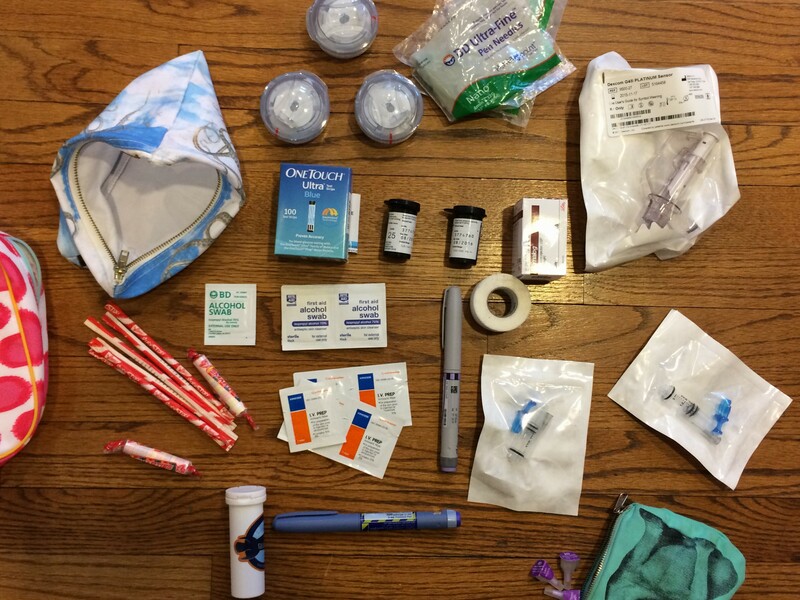 I’ve often waxed poetic on this blog about what it’s meant to get Type 1 Diabetes as an adult. Most Type 1 diabetics (but not all) were diagnosed as children. This meant that their parents or caregivers became experts in their disease before they did. I’ve watched plenty of documentaries about parents of young children with diabetes, and it looks terrible – the stress that it puts on the parents, having to manage this unmanageable disease for their kids, seems horrendous. I’m very grateful to have spared my parents that. And yet a small, selfish part of me knows that if I had gotten this disease at 10, or 5, or 3, I would have a set of caregivers on my side who would have necessarily become experts in my diabetes. It would have probably meant that on Friday, when I called home and chatted with my mom about my weekend away, she would have said, “And you packed juice boxes, right? ” and I would have said, “Ah, crap!” and rushed to the pantry, and thrown an 8-pack in my bag. Instead, being, as she is, an expert in most everything else, my mom reminded me to pack a heavy coat, and I thought, duh, yes, I’m going to Boston and it’s freezing there, and I rushed to the closet and pulled out the winter coat I’d hoped was done for the season. But my mom doesn’t know about the juice boxes, obviously, because she didn’t spend 20 years knowing about those juice boxes. And yes, I’ll admit, the part of me that feels overwhelmed by this disease, that feels like I’m not nearly competent enough to take it on, wishes I had such built-in allies. But then, of course, I think what it would mean to have put my parents through that, and I quickly un-wish it. I have so many wonderful, wonderful friends and loved ones in my life, and you have all been incredible, incredible support for me. I know your support is offered freely and with love, and I appreciate it (and take you up on it!) all the time. I would be lost without you. Diabetes can make me kind of a jerk. Lows, especially, make me crappy and anxious and demanding. Stefan can confirm this. It’s honestly at least in part out of my control – that’s a legitimate physiological result of low blood sugar. And I find that my irritation eagerly grabs on to an offer to help that is sincere but misinformed. When my blood sugar is 55 and someone asks me if I need insulin, I want to snap God, no!!!! Insulin LOWERS your blood sugar, my blood sugar is already LOW! Or when my blood sugar is 300 and someone asks me if I need to eat, I often have to clamp down the urge to snap Food is literally the last thing I need at this moment!! Because that irritation is not real irritation, not at the person. I know what they’re really saying to me in that moment is “What do you need?” which is honestly the nicest, most thoughtful thing you can say to me. The irritation comes from the tiny, overwhelmed, insecure part of me screaming “I DONT KNOW I DONT KNOW I DONT KNOW WHAT I NEED BECAUSE I DONT KNOW WHAT IM DOING!” The part that realizes that I am the ultimate expert in this disease, I’m the general, and I have legions of troops asking for orders, and I’m scared I’m going to mess it up and give them the wrong ones, because honestly, I’m not much for warfare at all, and I think I’m making a pretty bad general. Because… I forgot the juice boxes. Which was a small error which caused some inconvenience, for sure, but was overcome. But when am I going to make the Big Error, the one that will cause more than inconvenience? They say that confident people are people who project confidence. They say to “fake it until you make it”, so maybe the answer is to act like I know what I’m doing, and that will make me automatically know what I’m doing. I’m not always insecure like this, but travel, which can no longer be spontaneous, but must now be meticulously planned, has reminded me of this terrible feeling of being outmatched. I think I’ll go pack another set of juice boxes.